Diabetes frequently develops in patients with pancreatic disorders. We aimed to determine the lower threshold of beta cell area for diabetes manifestation as well as the impact of insulin sensitivity on glucose homoeostasis in patients with pancreatic diabetes. Eighty-two patients undergoing pancreatic surgery underwent pre-operative oral glucose challenge. Fractional pancreatic beta cell area was determined, and indices of insulin sensitivity and beta cell function were calculated. HbA1c and glucose levels were similar in patients with high and intermediate beta cell area, but were significantly higher in those with the lowest beta cell area (p < 0.0001). Insulin secretion was reduced only in patients with the lowest beta cell area (p < 0.001). The relative beta cell deficits at the onset of diabetes and impaired glucose tolerance were 64% and 21%, respectively, based on 2 h glucose levels. Deteriorating insulin sensitivity was associated with a small increase in the incidence of diabetes. In conclusion, pancreatic diabetes probably develops after a reduction in beta cell area of ~65%. Post-challenge glucose excursions are much more closely related to pancreatic beta cell area than to fasting glycaemia, thereby underlining the usefulness of the OGTT in patients with pancreatic disorders. The online version of this article (doi: 10.1007/s00125-012-2466-8) contains peer-reviewed but unedited supplementary material, which is available to authorised users. Diabetes frequently develops in patients with pancreatic disorders. In patients with chronic pancreatitis, the prevalence of overt diabetes is ~35%, and another 30–40% of patients present at prediabetic stages, depending on the severity and duration of the underlying pancreatitis [1, 2]. In a similar way, pancreatic carcinomas are often associated with the development of diabetes [3, 4]. In fact, the manifestation of diabetes in lean patients without a typical history of type 2 diabetes has been considered as a clinical indication of pancreatic carcinoma . At present, studies on the pathogenesis of pancreatic diabetes in humans are relatively sparse, but progressive beta cell destruction is held to be the major underlying cause [5, 6]. Whether insulin resistance is involved in the development of diabetes in such patients is not known, given the paucity of studies in this area. However, because most patients with pancreatic diseases tend to suffer from malnutrition rather than from obesity, insulin resistance is less likely to be present [7, 8]. Alternatively, the inflammatory process that accompanies pancreatic cancer and pancreatic adenomas, as well as chronic pancreatitis, might lead to additional impairments in peripheral insulin action and insulin secretion [9, 10]. These questions are of high clinical relevance because currently no specific guidelines or recommendations exist for the management of pancreatic diabetes. We have previously analysed the histological changes in the endocrine pancreas of patients with chronic pancreatitis. These studies revealed a reduction in pancreatic beta cell area of ~30–40% in patients with chronic pancreatitis . Furthermore, a retrospective case series of 114 patients with chronic pancreatitis established an inverse curve–linear relationship between fasting glucose concentrations and beta cell area . However, by design information on insulin secretion and insulin sensitivity was not available in these studies. Therefore, in the present study, we performed standardised 240 min oral glucose challenges, including frequent measurements of glucose, insulin and C-peptide, in a large group of patients immediately before they underwent pancreatic surgery for various causes. The extent of beta cells was determined within the pancreatic tissue removed at surgery and related to various measures of glucose control, insulin secretion and insulin sensitivity. By these means, we addressed the following questions: (1) what is the mean lower threshold for beta cell area below which diabetes develops; and (2) does insulin resistance modify the relationship between beta cell area and glucose homoeostasis? Eighty-two patients undergoing pancreatic surgery for chronic pancreatitis, pancreatic cancer, pancreatic adenomas or papillary tumours necessitating partial pancreatectomy were studied pre-operatively with a 240 min oral glucose challenge. Fractional beta cell area was determined histologically in the partially resected pancreas. The study protocol was approved by the ethics committee of Ruhr University Bochum (registration number 2528). All patients provided written informed consent prior to study enrolment. Part of the results (beta cell area as well as glucose, insulin and C-peptide data) from 33 study participants have previously been reported from a study designed to evaluate different indices of beta cell function in relation to beta cell area . A total of 82 patients (42 men, 40 women) undergoing pancreatic resections in the Department of Surgery, St Josef Hospital, Ruhr University Bochum, between the years 2004 and 2010 were included. Among these, 34 patients had been diagnosed with chronic pancreatitis, 13 underwent surgery for the removal of benign pancreatic adenomas and seven patients underwent partial pancreatectomy because of tumours of the ampulla of Vater or a cholangiocellular carcinoma. Pancreatic cancer was diagnosed in 20 patients, and eight patients were diagnosed with intraductal papillary mucinous neoplasms (IPMNs). The clinical diagnoses were confirmed by an independent pathologist in all cases. In patients with chronic pancreatitis surgery was performed in case of chronic duct obstruction or if conservative treatment approaches had failed to provide sufficient analgesia. In 24 patients distal pancreatectomies (pancreas tail resection) were performed, whereas 56 patients were treated with a proximal pancreatectomy (pancreas head resection). Total pancreatectomies were performed in two cases. Pancreatic beta cell areas were not different between tissue samples from the pancreatic head and the tail region (0.92 ± 0.09% vs 0.88 ± 0.12%, respectively, p = 0.84). For the histomorphological evaluation of the pancreas in adenoma or cancer patients, only pancreatic samples that were at least 2 cm distant from the tumours were evaluated. Diabetes was previously known in 16 patients (treated with insulin in seven participants, glimepiride in one participant, repaglinide in one participant, metformin in one participant and diet in six participants), whereas the other patients had no history of known diabetes. Eighteen patients had a first-degree relative with type 2 diabetes, seven patients had a second-degree relative with type 2 diabetes, and 57 patients had no family history of diabetes. None of the patients had a severe impairment in renal or liver function. The experiments were performed in the morning after an overnight fast, with participants in a supine position throughout the experiments. All other concomitant medication was withdrawn from the evening of the preceding day. All glucose-lowering treatment was withheld at least 24 h prior to the experiments. In insulin-treated patients, the last injection of short-acting insulin was performed on the evening before the tests, whereas all long-acting insulins were withheld for at least 24 h in order to avoid carry-over effects. Both ear lobes were made hyperaemic using Finalgon (nonivamid 4 mg/g, nicoboxil 25 mg/g). The experiments were started by the ingestion of the oral glucose load (75 g glucose in 300 ml) over 5 min, and capillary (from the ear lobe) and venous blood samples were drawn at t = −5, 0, 15, 30, 60, 90, 120, 150, 180, 210 and 240 min. Capillary blood samples (approximately 100 μl) were added to NaF (Microvette CB 300; Sarstedt, Nümbrecht, Germany) for the immediate measurement of glucose. Venous blood was drawn into chilled tubes containing EDTA and aprotinin (Trasylol; 20,000 kallikrein inhibitor units/ml, 200 μl per 10 ml blood; Bayer, Leverkusen, Germany) and kept on ice. After centrifugation at 4°C, plasma for hormone analyses was kept frozen at −28°C. Glucose was measured as described  using a glucose oxidase method with a Glucose Analyser 2 (Beckman Instruments, Munich, Germany). Insulin was measured as described , using an insulin microparticle enzyme immunoassay (MEIA; IMx Insulin, Abbott Laboratories, Wiesbaden, Germany). Cross-reactivity with proinsulin was <0.005%. The intra-assay coefficient of variation was 4%. C-peptide was measured as described  using an ELISA from DAKO (Ely, UK). The intra-assay coefficient of variation was 3.3–5.7% and the inter-assay variation was 4.6–5.7%. Human insulin and C-peptide were used as standards. Pancreatic resections were fixed in formaldehyde and embedded in paraffin for subsequent analysis as previously described . Sequential 5 μm sections were stained for insulin using a guinea pig anti-insulin antibody (DAKO; A 0564, lot 00001500) at 1:400 dilution and an alkaline phosphatase/Real Envision Detection System (DAKO; K 5007 and K 5005, lots 00025382 and 00025812, respectively). Because the weight of the pancreas is not routinely measured at the time of pancreatic surgery, the total beta cell mass (pancreatic weight × fractional pancreatic beta cell area) could not be determined. Therefore, the fractional beta cell area of the pancreas was measured in a large representative section of the tissue removed at surgery, in line with previous studies in humans [11, 12, 13, 14, 15] and rodents . However, because the variation in pancreatic weight between different individuals is rather small , the insulin-positive area of the pancreas can be taken as a surrogate marker for beta cell mass. For the determination of the fractional beta cell areas, the entire pancreatic sections stained for insulin were imaged using a Zeiss Axioplan microscope (Zeiss, Göttingen, Germany) equipped with a motorised stage ×100 magnification (×10 objective). A tile image of the tissue section was generated using the ‘Mosaix’ tool of the software Axiovision, version 4.5 (Fig. 1). The fractional areas of the pancreas stained positive for insulin were digitally quantified using a colour-based threshold using Zeiss Axiovision software as previously described . Insulin sensitivity/resistance was determined using the Matsuda index as well as the HOMA-insulin resistance (HOMA-IR) index, as described [18, 19]. The HOMA beta cell function index was calculated as described previously . Further insights in beta cell function were sought by mathematical modelling (see below and electronic supplementary material [ESM]). The analysis of the glucose and C-peptide curves during the OGTTs follows the general strategy described in a previous publication , and builds on previous work from other laboratories [21, 22]. In close parallel to the methods described in Cobelli et al. , the insulin secretion rate (ISR) is described as the sum of two components, one corresponding to the rate of increase of glucose, the other to glucose concentration itself. Modelling details are provided in the ESM. Model fit to the C-peptide data was fairly good (ESM Table 1). Unknown variables in the model were estimated with good precision (ESM Table 2). There are two main physiological outputs of the model: (1) derivative  or dynamic  control (pmol/m2 BSA) × (mmol l−1 min−1)−1 of beta cell function—it is presented as the amount of insulin secreted in response to a rate of glucose increase of 1 mmol l−1 min−1 which lasts for 1 min; and (2) proportional  or static  control of beta cell function—it is presented as the stimulus–response curve linking glucose concentration (x-axis) to ISR ([pmol min−1 m−2 BSA]; y-axis) at the pre-selected glucose concentrations of 4.0, 5.5, 8.0, 11.0 and 15.0 mmol/l. Participant characteristics are reported as mean ± SD and results are presented as mean ± SEM. Time-course measurements were carried out by unpaired ANOVA, using Statistica version 5.0 (Statsoft Europe, Hamburg, Germany). By these methods, three different p values were calculated: (1) for the determination of overall differences between the different groups, independent of the respective time patterns; (2) for the determination of differences over the time course, independent of the respective groups; and (3) for the determination of differences between the groups over the time course. If a significant (p < 0.05) interaction between group and time was documented, values at single time points were compared by one-way ANOVA. All other variables were compared by one-way ANOVA. A p value < 0.05 was taken to indicate significant differences. Correlation analyses were carried out using GraphPad Prism 4 using linear or non-linear regression functions. In order to assess the importance of the pancreatic beta cell content for glucose homoeostasis, patients were divided into tertiles according to their pancreatic beta cell area. The average beta cell areas in the tertiles were 0.26 ± 0.02%, 0.78 ± 0.03% and 1.58 ± 0.10%, respectively (p < 0.0001). Plasma glucose concentrations increased in all three groups after glucose ingestion (p < 0.0001; Fig. 2). Both fasting and post-challenge glucose levels were significantly higher in the group with the lowest beta cell area (p < 0.0001), but there were no differences between the other two groups (Fig. 2). Fasting insulin and C-peptide concentrations were similar in all three groups. However, the early increases in insulin and C-peptide concentrations were significantly reduced in the individuals with the lowest beta cell area (p < 0.001, respectively; Fig. 2). The C-peptide/glucose ratios under fasting conditions and 30 min after glucose ingestion were significantly lower in the low beta cell area tertile (p < 0.05), but there were no differences between the groups with high and intermediate beta cell area (Table 1). HOMA beta cell function was not different between the groups (0.52). Insulin sensitivity, as measured by either the HOMA index (p = 0.27) or the Matsuda index (p = 0.54), was similar in all three groups. Model-derived variables of beta cell function depicted a similar scenario. The derivative control (i.e. the response of the beta cell to the rate of glucose increase), was similar in the high and intermediate beta cell area tertile (1,137.0 ± 194.1 and 1,041.4 ± 152.1 [pmol/m2 BSA]/[mmol l−1 min−1], respectively), but markedly decreased in the low beta cell area tertile (291.5 ± 68.6 ([pmol/m2 BSA]/[mmol l−1 min−1], p < 0.01 vs both high and intermediate tertiles). The proportional control (i.e. the response of beta cell to glucose concentration per se) was significantly lower in individuals with the lowest beta cell area, but similar in individuals with high and intermediate beta cell area (p < 0.0001; Fig. 3). In order to further study the impact of pancreatic beta cell area on glucose homoeostasis, fasting glucose concentrations as well as the glucose concentrations measured 120 min after oral glucose ingestion and the HbA1c levels were examined in relation to the respective pancreatic beta cell area (Fig. 4). There was an inverse relationship between both fasting and post-challenge glycaemia as well as HbA1c levels and the respective beta cell area that was best described by a curve–linear relationship. However, the degree of association, as determined by the correlation coefficients, was much closer for post-challenge glucose levels (r = 0.82) than for either fasting glucose (r = 0.50) or HbA1c levels (r = 0.32; Fig. 4). Further examination of this relationship revealed that the mean threshold for beta cell area below which diabetes develops was 0.5% of the total pancreatic area, based on the 120 min post-challenge glucose levels, corresponding to a 64% beta cell loss in relation to individuals with normal glucose tolerance (NGT; 1.39% beta cell area). The respective beta cell area threshold for impaired glucose tolerance (IGT) was 1.1% of the total pancreatic area (21% deficit). In contrast, when fasting glucose concentrations were used to determine this relationship, the beta cell threshold for the manifestation of overt diabetes was 0.1% (93% deficit vs individuals with NGT), and impaired fasting glucose (IFG)/IGT developed below a mean beta cell threshold of 0.6% (57% deficit). For HbA1c levels, the association with beta cell area was much weaker than for the glucose variable (r = 0.32). When the recently introduced criteria for diabetes (>6.5%) or individuals at risk (6.0–6.5%) were employed, the beta cell threshold for diabetes was 0.15%, corresponding to an 89% beta cell deficit, and the high-risk range started below 0.5% beta cell area (64% beta cell deficit). However, the inter-individual variation for HbA1c concentrations at similar degrees on beta cell area was rather substantial (Fig. 4). Beta cell area was also examined in relation to the family history of diabetes. Thus, beta cell area was 0.66 ± 0.12% in patients with a first-degree relative, 0.77 ± 0.23% in patients with a second-degree relative and 0.97 ± 0.09% in patients without diabetic relatives (p = 0.17). Insulin sensitivity, as determined by the Matsuda index, was 5.6 ± 0.6 in patients with diabetes, 6.3 ± 0.9 in patients with IGT/IFG, and 8.7 ± 0.9 in individuals with normal glucose tolerance (p = 0.025). The corresponding values for HOMA-IR were 3.7 ± 0.5, 2.6 ± 0.6, and 1.2 ± 0.2, respectively (p = 0.0050). Interestingly, both measures of insulin sensitivity/resistance were unrelated to BMI in this group of patients (r 2 = 0.0066, p = 0.48 and r 2 = 00080, p = 0.059, respectively). In order to examine whether the relationship between pancreatic beta cell area and glucose homoeostasis is influenced by the degree of insulin sensitivity, the patients were grouped into tertiles according to their insulin sensitivity. The Matsuda index was 3.03 ± 0.18, 6.01 ± 0.20, and 11.0 ± 0.50 in individuals with low, intermediate and high insulin sensitivity (p < 0.0001). Pancreatic beta cell area was not different between the groups (p = 0.62). Insulin secretion, as judged by the 30 min post-challenge C-peptide/glucose ratio, was higher in individuals less sensitive to insulin (p < 0.0001). When the association between beta cell area and the 120 min post-challenge glucose concentrations was examined separately in each of these groups, there was a complete overlap of the respective regression curves (Fig. 5). In contrast, the regression curves for the association between fasting glycaemia and beta cell area were shifted upwards with declining degrees of insulin sensitivity, suggesting that insulin resistance had an additional impact on the development of fasting hyperglycaemia in these individuals. Finally, insulin secretion (30 min post-challenge C-peptide/glucose ratio) was examined in relation to insulin sensitivity (Matsuda index) in the tertiles of pancreatic beta cell area (Fig. 6). The regression curves between insulin secretion and sensitivity were shifted downwards in patients with the lowest beta cell area, underlining the fact that insulin secretion was markedly reduced in patients with the lowest beta cell area. However, there was no apparent difference in the impact of insulin resistance on the development of diabetes in the three groups. The present study was designed to examine the relationship between glucose homoeostasis and pancreatic beta cell area as well as insulin sensitivity in a large group of patients with and without pancreatic diabetes. We report that the lower beta cell area threshold for the development of diabetes is ~35% of normal. Whereas post-challenge glycaemia appears to primarily depend on pancreatic beta cell area, fasting glucose concentrations increase further with greater degrees of insulin resistance at a given beta cell area. The beta cell threshold for diabetes manifestation of ~35% of normal reported here is in line with studies in large animal models revealing a similar relationship between fasting glycaemia and pancreatic beta cell mass [23, 24]. However, these findings are at variance with studies in young rats and mice suggesting that a similar reduction of beta cell mass can be tolerated without impairments in glucose homoeostasis, mainly because of a compensatory regeneration of beta cells in the pancreas remnant [25, 26]. Because beta cell regeneration does not seem to occur in adult humans at a similar rate as in young rodents [27, 28, 29], this failure of beta cell regeneration might explain the discrepancy between studies in young rodents and in adult humans or in large animal species. Nevertheless, the fact that the human pancreas is capable of tolerating up to ~65% loss of beta cells without any detectable abnormalities in glucose metabolism, and a beta cell loss of more than 90% without the development of overt fasting hyperglycaemia is remarkable and demonstrates a great reserve capacity of the endocrine pancreas. This finding may also explain why diabetes typically develops rather late during the course of chronic pancreatitis, whereas exocrine functional abnormalities can be detected much earlier . Because all patients included in this study had undergone surgery for underlying pancreatic diseases and presented with a relatively low BMI, it is most likely that the development of diabetes was primarily due to alteration of the pancreatic islets. However, other organs might also have been involved in the development of diabetes in these individuals. In particular, one might argue that subtle impairments in liver function in some patients might have had an impact on the individual threshold for diabetes manifestation, although patients with advanced liver cirrhosis were not included in this study. Even though the extent of pancreatic beta cells appeared to be the primary factor for the development of diabetes in this group of patients, insulin resistance might have had a small additional impact on the manifestation of hyperglycaemia. Thus, the curve–linear relationship between pancreatic beta cell area and fasting glucose concentrations was shifted upwards by ~0.44 mmol/l (8 mg/dl) in individuals with the lowest insulin sensitivity compared with the most insulin-sensitive individuals. This is consistent with previous studies showing that a modest increase in BMI confers a greater risk for developing diabetes after a partial pancreatectomy even in a predominantly lean population of patients with chronic pancreatitis . 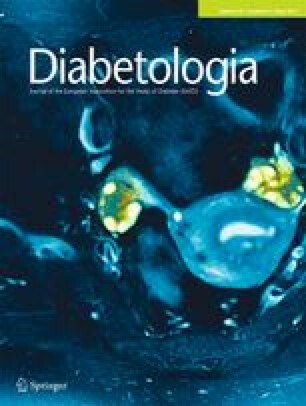 Interestingly, the degree of insulin sensitivity appeared to be less important for the 120 min post-challenge glucose concentrations, indicating that the glycaemic response to the oral glucose load was primarily determined by the extent of pancreatic beta cells. Similarly, the present study has revealed a much closer relationship between pancreatic beta cell area and post-challenge compared with fasting glucose concentrations. In addition, when the diagnostic thresholds for diabetes were considered in relation to the respective pancreatic beta cell area, the 120 min glucose value during the OGTT allowed for the diagnosis of diabetes already at a relative beta cell deficit of 64% compared with normal glucose-tolerant individuals, whereas overt fasting hyperglycaemia developed only at a mean beta cell deficit of 93%. These unequal associations between fasting and post-challenge glycaemia with beta cell area are consistent with previous studies in patients with type 2 diabetes demonstrating that the aetiologies of IFG and IGT are likely to involve different pathogenetic mechanisms . Taken together, these findings strongly argue in favour of a broader use of the OGTT in order to detect abnormalities in glucose homoeostasis in patients with pancreatic diseases. An inverse relationship between beta cell area and fasting glucose concentration has previously been shown in an autopsy study of a patient group with and without type 2 diabetes . However, in spite of these similarities it is important to emphasise that the present findings cannot readily be translated to patients with type 2 diabetes. In fact, in the present study only patients with underlying pancreatic or abdominal disorders necessitating pancreatic surgery were included, and the mean BMI was ~24–25 kg/m2. Even though various lines of evidence have suggested that beta cell destruction is an essential component of type 2 diabetes [12, 33], other factors, such as obesity and insulin resistance are likely to play a more prominent role in type 2 diabetes than in the presently studied patient group . Although all patients included in this study underwent surgery for pancreatic abnormalities, the underlying causes involved a number of different disease entities, including pancreatic cancer, chronic pancreatitis or pancreatic adenomas. Arguably, this might introduce a confounding factor to the present analysis. Against this, beta cell area was not different between the patients with different diseases, and the relationship between beta cell area and glycaemia was observed across all patient groups. Another limitation of this study is the fact that it was not possible to exactly determine beta cell mass, because pancreatic weight cannot be determined in living humans. However, previous studies in humans have demonstrated that the variability of pancreatic volume and mass in humans is rather low , meaning that the inter-individual variations in beta cell mass are primarily driven by the fractional beta cell area rather than by pancreatic mass. Furthermore, the calculation of beta cell area as a surrogate of beta cell mass is in line with numerous previous studies in human pancreatic tissue [11, 12, 13, 14, 15]. Although this study was primarily designed to examine the pathogenetic relevance of a beta cell loss in patients with pancreatic abnormalities, several clinical implications seem to arise. The tight association between the 120 min OGTT glucose concentration and beta cell area suggests that the OGTT should be routinely employed in individuals with pancreatic disorders in order to detect early abnormalities in glucose homoeostasis, whereas fasting glucose or HbA1c levels are less closely related to beta cell area. Furthermore, the relative importance of beta cell loss in relation to the impairments in insulin action might provide a rationale for the early supplementation of insulin in such patients, whereas treatment strategies that act primarily to improve insulin sensitivity (e.g. metformin or glitazones) might be less favourable in such patients. In relation to these considerations it is worth mentioning that, to our knowledge, no prospective randomised trials on the efficacy and safety of various glucose-lowering strategies in patients with pancreatic diabetes exist, although the clinical relevance of this question is certainly substantial. In conclusion, the present study demonstrates that pancreatic diabetes probably develops after a reduction in beta cell area of ~65%. Post-challenge glucose excursions are much more closely related to pancreatic beta cell area than fasting glycaemia, thereby underlining the usefulness of the OGTT in patients with pancreatic disorders. The excellent technical assistance of B. Baller, K. Mros (both at the Department of Medicine, St Josef Hospital, Bochum, Germany) and G. Müller (Department of Pathology, Bochum, Germany) is gratefully acknowledged. We thank L. Boselli (Division of Endocrinology, University of Verona, Italy) for performing the modelling analyses of the OGTTs. These studies were supported by grants from the Deutsche Forschungsgemeinschaft (DFG grant-no. Me2096/5-1 to JJM), the Ruhr-University of Bochum (FoRUM grants to JJM), and an EFSD/Novartis grant and research grants of University of Verona (both to RCB). JJM designed the study, analysed the data and wrote the manuscript. TGKB and BAM participated in the data acquisition and analysis, discussed the data and edited the manuscript. RCB contributed to data analysis and manuscript preparation. AT contributed to the histological analyses, discussed the data and edited the manuscript. WU, HS and WES contributed to analysis and interpretation of the data and edited the manuscript. All authors read and approved the final version.